Who should take the PADI Instructor Development Course (PADI IDC)? Why become a PADI Scuba Diving Instructor? Becoming a PADI Scuba Diving Instructor (OWSI) will allow you the opportunity to work in a dynamic and growing industry worldwide, where you will come into contact with people from all walks of life and become instrumental in changing their and your lives for the better! Take a look at our Go Pro Package Deals. We offer a discount for multiple course bundles and free accommodation! 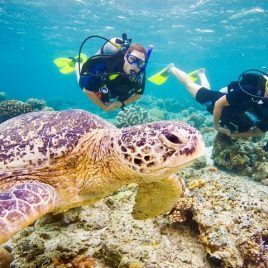 In Utila you will meet other professionals from the dive industry and become a part of a world-wide network in one of the most beautiful settings in the world at one of the most energetic dive resorts. As a scuba diving instructor, opportunities abound to further your professional dive training into the many realms of the scuba diving industry by participating in Specialty Instructor courses, which train you to teach PADI Specialty Courses after receiving your instructor certification. The knowledge development segments of the IDC at Underwater Vision take place in our brand-new classroom, an air-conditioned space dedicated solely for the use of IDC candidates. Free Wireless Internet and a resource library is available solely for the use of the students! 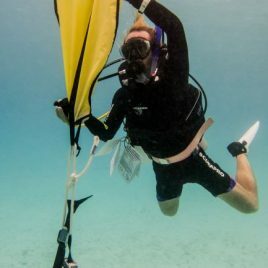 The confined water exercises will be practiced and presented just in front of the resort off of the dock, and the open water sessions will be done at near-by dive sites from our custom built dive boats. 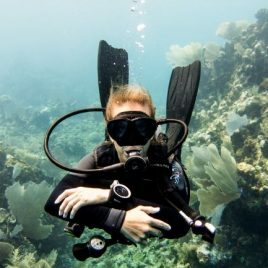 Your Utila instructor training experience begins with an optional two day refresher course, where PADI Platinum-Rated Course Director Diego Frank completes theory review as well as a scuba skills review. The following two days are spent completing the [efricouresepage] level certification. Visit Underwater Vision to ask about an IDC. 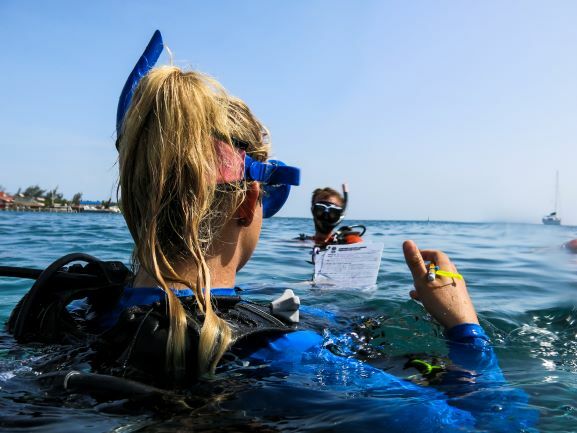 Starting with the PADI Assistant Instructor Course course, IDC Candidates will complete the skills needed to move forward into the PADI Open Water Scuba Instructor (OWSI) program. Over the course of your IDC you will make close acquaintance with your classmates and IDC Staff Instructors and Course Director Diego Frank, learning and perfecting all of the skills you will need to successfully complete your Instructor Examination (IE), and so much more. In the course of 10 action-packed days, you will participate in and lead presentations in the classroom, confined water and open water environments. You will learn problem solving skills, teaching methods and hone your presentation preparation abilities. The final three days of the IDC are when you will perform what is called the 'Mock IE'. You will write examples of each of the theory exams and have them graded so that you know which areas you need to focus on for studying. Each student will be given assignments to prepare -just like in the real Instructor Exam. 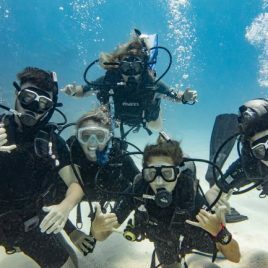 Students will do their presentations for their classmates and be evaluated by the PADI Staff Instructors at Underwater Vision and by PADI Course Director Diego Frank, as though in the actual exam. This is extremely valuable as you will be able to get a feeling of how the Instructor Exam is scheduled and get a final chance to practice and learn from your evaluation. The final day of the IDC is normally reserved for review, consultation and any extra practice you may want to have before the examination begins. Everything you accomplish during the IDC is done in preparation for the Instructor Examination (IE), where PADI examiners come from around the world to adjudicate all of the IDC candidates in the area. It is the culmination of all of your hard work and effort and most candidates have a great time doing it! You’ll want to continue your professional instructor training by completing courses that allow you to teach beyond the core courses. Once you have completed your IE, Underwater Vision will give you the PADI Emergency Oxygen Provider Instructor course FREE to get you started down the road to become a PADI Master Scuba Diver Trainer (PADI MSDT). We also encourage staying on in Utila and continuing with our MSDT preparation course and the MSDT internship program (FREE with the MSDT preparation course), following the IE in order to gain valuable teaching experience with some of the most capable and knowledgeable instructors on Utila. We guarantee you a minimum of 25 teaching certifications which can take one month or less to achieve, or you may have the option to stay longer. Doing the MSDT internship program will ensure that you gain instructor level certifications in some of the specialty training courses thereby making you more employable by acquiring a broader level of teachable scuba diving courses to add to your CV. 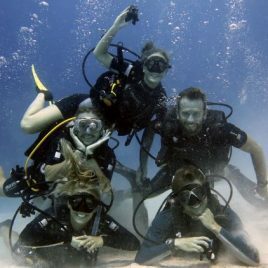 Be certified as a PADI Divemaster or a PADI Assistant Instructor Course or be an instructor in good standing with another training organization for at least six months (contact us for qualifying credentials). 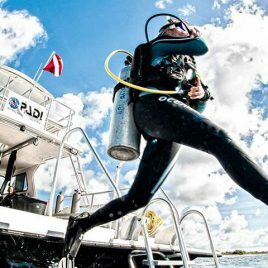 Be fit for diving and submit a PADI Pro Medical Statement (pdf) signed by a physician within the last 12 months (this can be completed at one of the clinics on the island). Send us an Enquiry to Book Now and receive a 10% discount on IDC training fees for booking in advance! 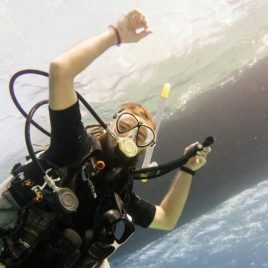 This package helps you become a PADI Open Water Scuba Instructor by attending the [efricoursepage] and the [idccoursepage]. Next you will attend the [msdtcoursepage] Prep Course and FREE Internship. To book this package you should already be a [dmcoursepage].